Hi friends…I hope that you’ve been enjoying the week so far! the pair of nightstands that I’ve had there for 13 years for the new pair that I talked about A FEW POSTS BACK. We had some MISMATCHED TABLES flanking the bed here at the house and while they served the purpose, I had always intended to do something different and smaller. Before the days of the internet and blogging we built this room onto our home as an addition. A window is on either side of the bed and beyond them are walls, so it’s a bit tight for a large table. The PREVIOUS TABLES didn’t have drawers and I prefer to have a drawer in a nightstand. Don’t you? I have several different bedding sets, comforters, duvets and sheet sets for our bed and change them out frequently. 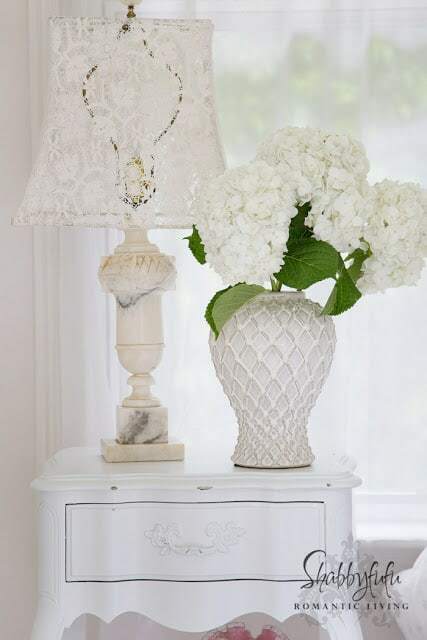 In the summer my favorite look is all white because it’s fresh and airy and a simple clean look to relax with. 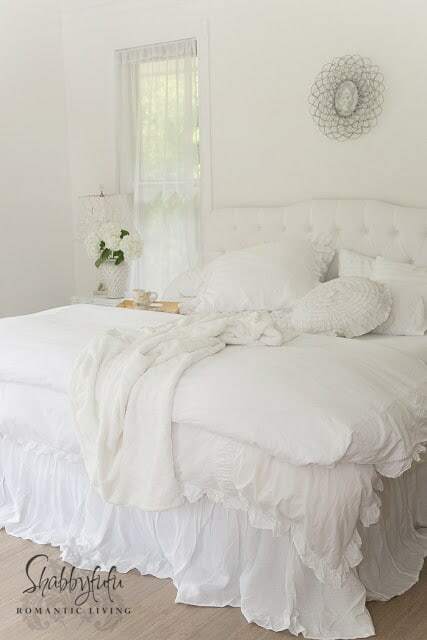 The bed today is a mix of bedding from various sources and in mixing and matching with white you can’t go wrong! It was pouring rain today and as I attempted to photograph the bed in the almost dark, I was so relaxed that I just wanted to crawl in and snuggle up with a good book. I’ve partnered with Superior Custom Linens for the beautiful LINEN DUST RUFFLE that is now on the bed. 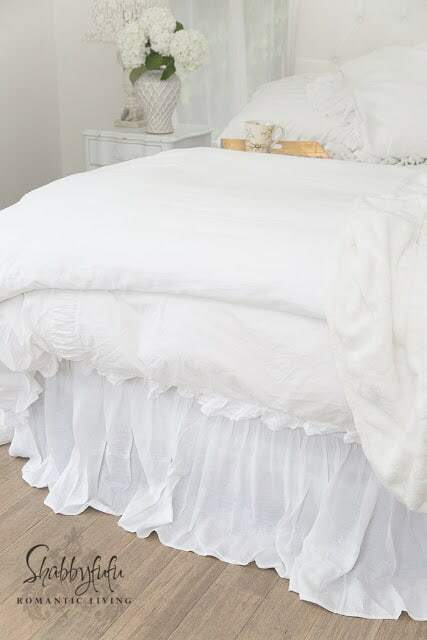 I love white linen and how it drapes and gathers so nicely and I ordered my BEDSKIRT a little bit long to puddle on the wood floor. SUPERIOR CUSTOM LINENS customizes the dust ruffles beyond just length…and since mine is what I wanted it to be lined. 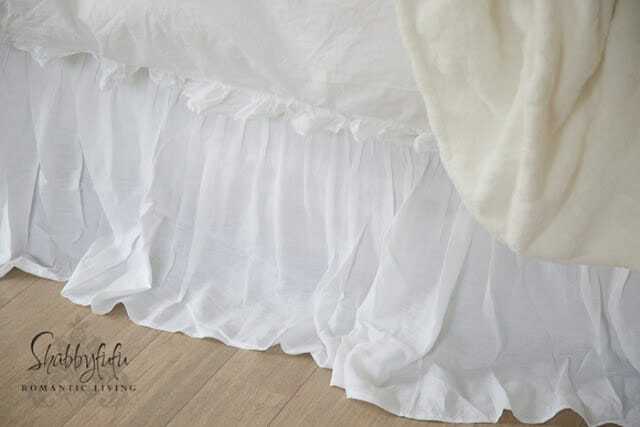 They did a high quality job and if you are looking for a LINEN BEDSKIRT they can be hard to find. Lots of colors are available and styles, as well as LINEN BED COVERS, BABY BEDDING, SHOWER CURTAINS and more. Everything is finished off nicely and I love the fact that linen is natural and cool and cleans up nicely. You might remember that a couple of years ago I RESCUED AND REPURPOSED Linen Drapes from a client’s condo at the Ritz Carlton. They are still going strong today and that’s the beauty of LINEN! You might just need some in your life if you haven’t yet gone that route and I never recommend a product that I don’t care for or question the quality of. SUPERIOR CUSTOM LINENS made one by one in the U.S. Thank you to Superior Custom Linens for providing me with the LINEN BED SKIRT, opinions are honest and my own.